Time for another New Year's Day doodle to get me revved up for the year ahead: Twenty-dozen..., er, -twelve. This one was done a bit simpler, since I had to do it in Photoshop on my father's computer (which crashed three times in the process of making this), but I feel it encapsulates the emotion (or "artistic vision") that I'm trying to convey. Or something like that. 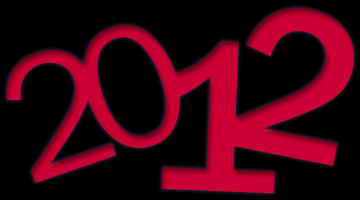 Last year, I'd said that the blank slate that 2011 held was both "refreshingly inspiring" and "paralyzingly daunting." Well, I obviously got through it alright. Now, for 2012, I've at least got some sort of plan... now I just have to execute it well in order to make this the best year it can possibly be. Talk about potentially daunting! But I'm up for the challenge! Currently, I'm packing up my stuff to head back to Pittsburgh tomorrow morning for the new semester which begins on Wednesday 4 January. Thankfully, I was able to get this done in between other tasks. But it also means you'll have to wait a bit longer for "real" stuff. Oh, well. I think you'll be fine.